It's the first week of Bourbon Heritage Month so I thought I'd take a look back and revisit a couple of older brands. Tonight's is Corner Creek Kentucky Straight Bourbon. 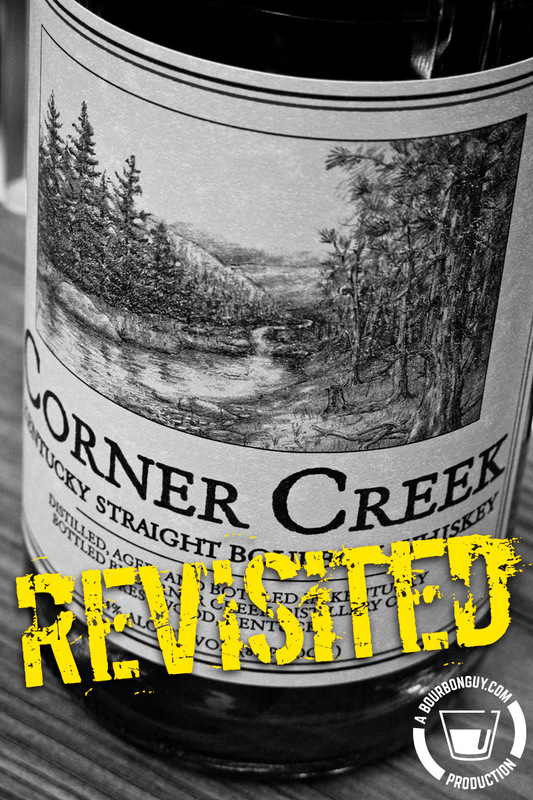 Though Corner Creek is older for a "modern" bourbon brand, it isn't a historic one. The brand has been around since 1988. In his 2004 book, Bourbon Straight, Chuck Cowdery wrote about it being a "4-grain" bourbon. Though he admitted it was likely a mix of Rye and Wheated styles. He liked it when he wrote the book. I did not agree when I published my first review in 2012. 2,088 days ago to be exact, on December 19, 2012. It was only the 8th whiskey review I'd published on the site. But it might have been one of the earlier sets of tasting notes that I'd put down to paper since in that post I was publishing tasting notes from a year prior to that. At the time, I was not a fan. Though I was too timid in yet to say so and gave it a "meh" rating. At the time of my review, it was sold in a tinted green wine bottle. It was still sold that way when I purchased my first bottles sometime in 2010/2011. I'm not sure who the brand owner was at the time, but the label was submitted for approval by Kentucky Bourbon Distillers (Willett) out of Bardstown, KY. Not surprising since they did a nice bit of business sourcing whiskey and bottling it for brands other than their own. Purchase Info: $29.99 for a 750 mL bottle at MGM Wine and Spirits, Burnsville, MN. Details: 44% ABV. Non-age Stated. Nose: Fruity and aromatic. You can catch the fruitiness on this one as you pour it into the glass. Along with that are dried grass, mint, and caramel. Mouth: Slightly underripe peaches (just before they turn into a sweet juicy mess), caramel and nutmeg. Finish: Medium length and dry. Lingering fruit and nutmeg. Thoughts: I like this much more than I did 6 years ago. And I don't think that is as much of a reflection on the relative bourbons as it is on how my palate has changed while I've been writing here. I'm much more open to flavor profiles that are out of the ordinary than I was back then. This is certainly a "change-of-pace" bourbon, but it isn't a bad one. In that respect, it reminds me of Jefferson's. Both are a little outside the typical bourbon flavor gamut. It is very fruity, almost reminding more of a fruit brandy than a bourbon. Overall, I like it. I'm upgrading this to a "Like" rating. When you go into a restaurant, do you expect that said restaurant has grown the vegetables they are serving you? Do you assume that they bred, raised, and slaughtered the cow that your steak was once part of? If you know that they are sourcing their ingredients from somewhere else, do you demand to know what farm they sourced them from? Of course, some restaurants pride themselves on doing just these things. But does it make you mad that not every restaurant does? Do you loudly proclaim to the internet that you have a right to know who the restaurant's suppliers are and propose boycotts of restaurants that can't tell you? Now, what if that restaurant is not a restaurant, but is instead a whiskey producer? If you know that the whiskey producer is not distilling the whiskey, do you loudly proclaim to the internet that you have a right to know who they sourced their ingredients from? Of course, there is a difference between a restaurant and whiskey producer. Namely that most restaurants do not also claim to be growers of vegetable and raisers of beef cattle. And until relatively recently, many Non-Distiller Producers (NDPs) did claim to be distillers. And of course, some still do. But I think it is sensible to point out those that are transparent about the fact that they didn't "kill the cow" and are instead specializing in being "an excellent chef." Using the ingredients that they source—in this case, bourbons—to create something different from and hopefully better than what they started with. Based on my reading this is what the folks who produced tonight's whiskey are saying. Jefferson's acknowledges they didn't distill the bourbons that went into their product. They do seem proud of the fact that they have blended them together into something they like more. In the end, though I value folks that grow and raise food, there is absolutely nothing wrong with being a good chef. Nose: Floral and fruity with vanilla, oak, and baking spice. Mouth: Nice tingly baking spice and very floral with a hint of fruitiness. Finish: Warm and of decent length. Initial notes of bubblegum transition to lingering notes of baking spice. Thoughts: I like this. It is a nice "change of pace" bourbon that is quite unlike the stereotypical bourbon flavor profile. It's one of those that you turn to when you want something a little different but not so different that you are looking at a different spirit entirely. The flavor reminds me a lot of Canadian Club but with more bourbon backbone. It's interesting.